For the first time, developing nations received more foreign direct investments than countries with advanced economies. 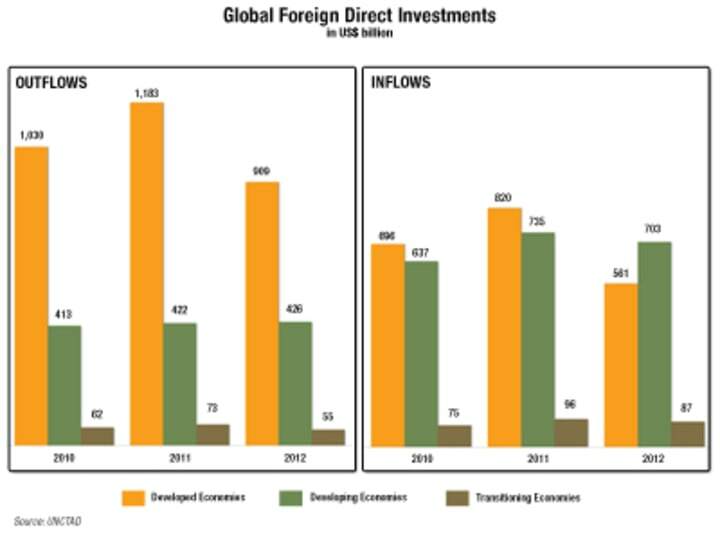 This is according to the 2013 World Investment Report, which tracked global FDI inflows and outflows in 2012. While flows to developing countries dipped 4 percent to $703 billion in 2012, investments in developing nations surpassed money committed to their richer neighbors by $142 billion. Although the increase in FDI inflows to developing economies appears encouraging, the report, which was produced by the U.N. Conference on Trade and Development, notes that the growing outpour of investments through offshore financial centers, or tax havens, remains a concern. For instance, the Africa Progress Panel found that multinational companies use tax havens to illegally channel funds to and from poor countries in Africa in order to evade taxes. 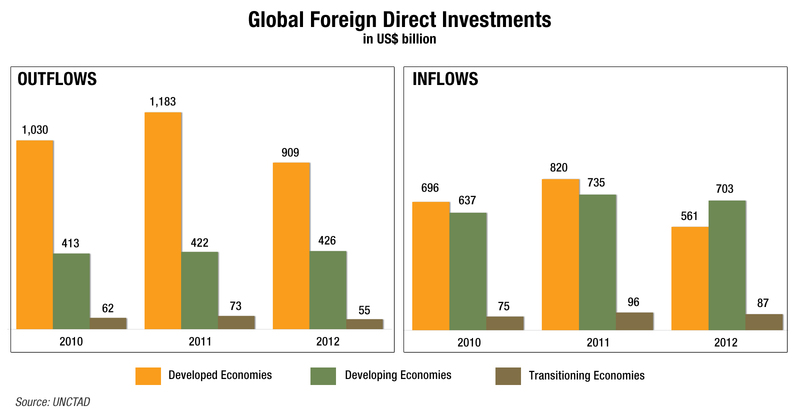 Overall, global FDI fell 18 percent from $1.6 trillion in 2011 to $1.3 trillion in 2012. The UNCTAD report attributes the decline to ongoing macroeconomic fragility and policy uncertainty in major economies that drive cross-border investments and facilitate international trade. The release of the 2013 World Investment Report coincides with the global development community’s final push to meet the Millennium Development Goals. Analysts acknowledge investing in developing economies is critical to creating jobs and alleviating poverty in these countries. In support of enabling poor nations gain wider access to global markets, the World Trade Organization is currently holding its Fourth Global Review of Aid for Trade in its headquarters in Geneva. The ongoing high-level meeting gathers representatives of donor agencies, governments, the private sector, civil society and the academe to discuss how development assistance can enhance the ability of companies from developing economies to engage in international trade and to recognize the strategic role that trade can play in achieving development outcomes. Juan Carlos is an analyst at the Devex Manila Office where he provides business information by producing early intelligence, donor funding strategy, and project reports. A strong advocate of civic education, he also teaches undergraduate courses on Philippine politics and governance.